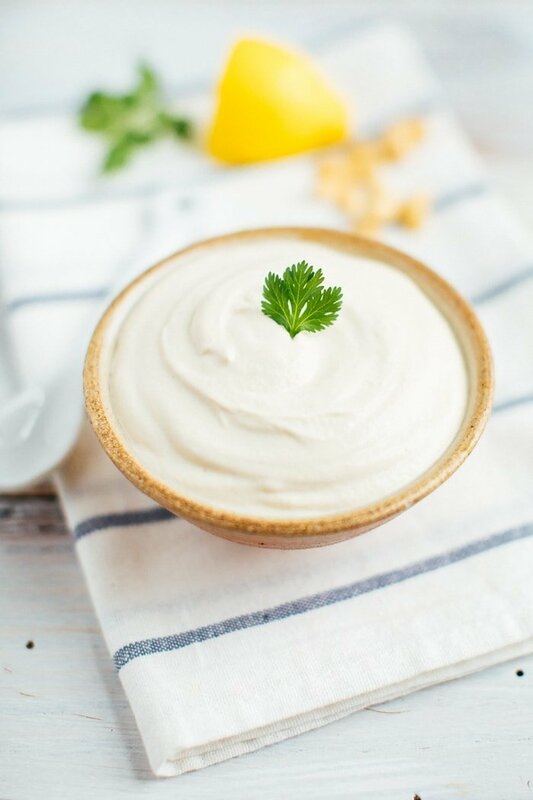 Dairy-free cashew sour cream made with five simple ingredients. It’s rich, creamy, has a mild flavor which makes it a great sub for regular sour cream in recipes! Vegan + gluten-free. It’s a fact, some foods taste so much better with a dollop of sour cream on top. Take chili, nachos or latkes for example, they’re good on their own, but adding a dollop of sour cream takes the whole dish to another level. However, I didn’t grow up using sour cream often and we rarely have sour cream in the fridge now since I usually just use plain Greek yogurt instead. 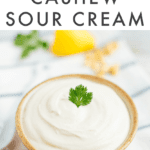 I always have it on hand and it tastes similar so that’s my go-to, however I may not need to anymore because recently I realized that you can make sour cream from cashews. I’m no stranger to using cashews to make creamy, dairy-free dressings and sauces (see my broccoli raisin salad, this low carb cauliflower “potato” salad and the vegan ranch that’s served with my buffalo cauliflower salad) but I hadn’t tried to make a sour cream until recently. I was looking for a non-dairy option to top the healthy sweet potato skins I’m sharing next week and this was the result. 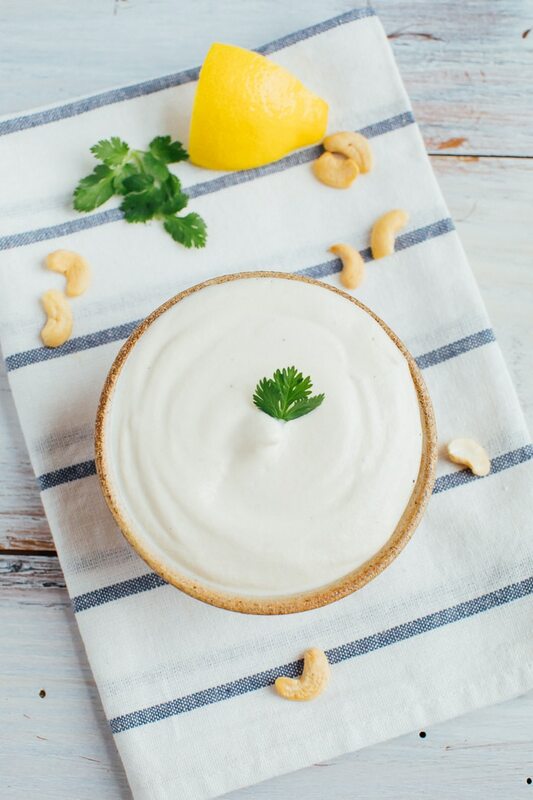 Want to know how easy this cashew sour cream recipe is? 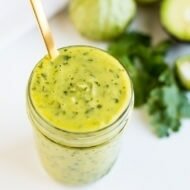 It requires only five simple ingredients and a blender! Just grab your soaked cashews, apple cider vinegar, lemon juice, non-dairy milk (or water) and a pinch of sea salt. Blend everything together and in 2 minutes you have a dairy-free cashew sour cream ready to use however you wish. Serve it at room temp or place in the fridge for a few hours if you prefer it chilled (placing it in the fridge will also make it a bit thicker). 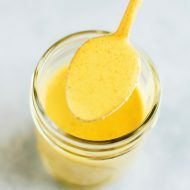 It’s rich, super creamy and has a little tang from the lemon juice and apple cider vinegar – it honestly tastes really similar to regular sour cream and I was pleasantly surprised after making it! Note that there is one step you can’t skip with this recipe, and that’s soaking your nuts. Soaking cashews is the key for almost any creamy cashew sauce/recipe and it’s super easy. Just add your cashews to a small bowl and cover with water. They only need to soak for about 1-2 hours to get soft enough, but you can certainly soak them longer if you have the time and need them softer. I typically soak anywhere between 2-8 hours. Once soaked, drain the water and use as needed in your recipe. The cashews will be soft, kind of mushy and might even turn a little purple. The purple part freaked me out the first time, but this is totally normal. 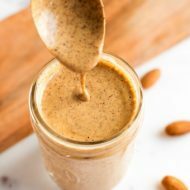 One last money-saving tip — when purchasing your cashews for this recipe (or any cashew sauce recipe) I recommend buying the raw cashew pieces from the bulk bin because they’re much cheaper than whole cashews (and it doesn’t matter if they’re whole because you’re blending them up anyhow). 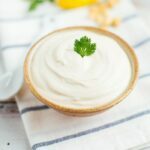 If you try this cashew sour cream recipe please leave a comment and star rating below letting me know how it turned out. Your feedback is so helpful for me and other EBF readers who are thinking about making the recipe. Dairy-free cashew sour cream made with five simple ingredients that’s rich and creamy with a mild flavor. It makes a great sub for regular sour cream! Vegan + gluten-free. Add cashews in a bowl and cover with water. Let cashews soak for 1-8 hours. Drain water. 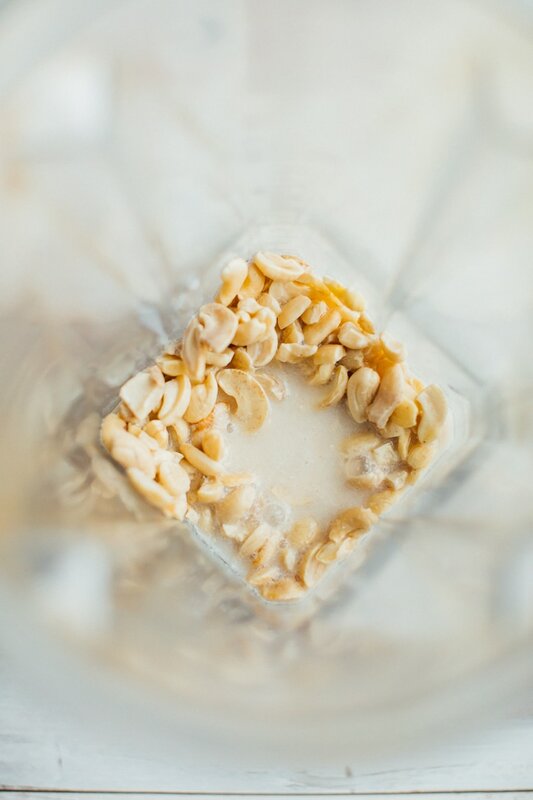 Add soaked cashews, lemon juice, apple cider vinegar and 1/2 cup dairy-free milk into a high-speed blender. Blend on high until creamy, if the mixture seems really thick, add more milk, 1 Tablespoon at a time until the mixture is blending smoothly, but don’t add too much because you don’t want the cream to be too thin. Once blended, pour sour cream into a dish and serve at room temp or place in the fridge. It will thicken as it chills. Cashew sour cream should last 3-4 days, up to a week in the fridge and up to 6 months if stored in the freezer. Hi Brittany! How long would you say this cream can stay fresh in the fridge? Hi Mai! The cashew sour cream should last in the refrigerator for 3-4 days, up to a week and can be frozen for up to 6 months.